Bad Religion, the third Kepler novel, is now available. Unlike the previous Keplers, this one will be available in print soon. The skinny: Nick and Elaine are shadowing Roy Sutton, the pastor of a suburban church. So far, they’ve found nothing on him, but one of Nick’s operatives comes across something that tells them they’ve been on the wrong track. But a collision on a lonely rural road keeps Nick from finding out what. It also forces Nick to look more closely at the church itself. Who’s really skimming the money? Is it Calvin Leach, the church leader who wants to be the next great televangelist? Is it Alex Pullman, whose real estate fortune was made paving over perfectly good neighborhoods to build upscale shopping malls? Is it one of the church board? Or is there more going on here, a religious schism that’s closer to Nick’s past than he imagined. In the background is Nikolai Karpov, the Russian mobster who seemingly likes Nick enough to want to bring him into his organization. Meanwhile, Elaine is dealing with the disintegration of her marriage and what her budding partnership with Nick means, both personally and professionally. This book was written in 2005 as the third book in the Kepler series. As often happens in small press, the book never saw the light of day. As I began releasing the first two Kepler novels and the collection, I dusted off the old manuscript and went through the beta reads that had been sitting around since 2006. I was pleasantly surprised to rediscover this story. It’s more complex than the first two Keplers. I’d like to thank Jennette Marie Powell for the awesome cover on this one. Covers are something I’ve struggled with. Jen began her career as a graphics designer. So doing a little back-and-forth and thinking about how crime novels normally look really brought this together quickly. I hit on the “keyhole” idea for the cover, and boom, Jen had it together a couple days later, better than I expected. This will be the first print novel I’ve offered since Northcoast Shakedown‘s original release in 2005. It’s time to return to print. The ebook editions will be $3.99. Print details will become available when that edition is ready. 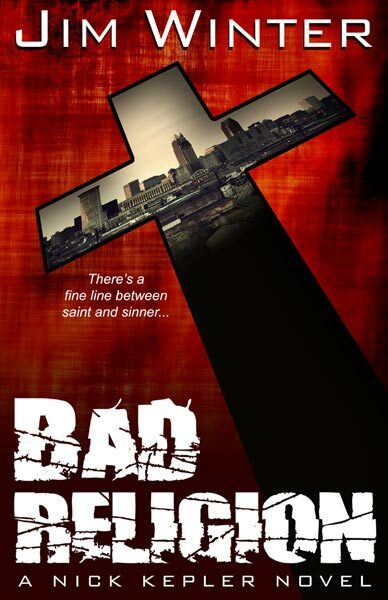 This entry was posted in Books, Ebooks and tagged Bad Religion, Nick Kepler. Bookmark the permalink. Congrats on the release! This was a fun cover to design. It helps when the client gives great direction!